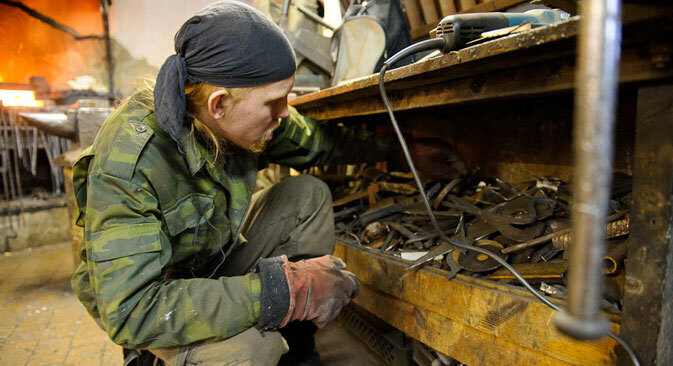 Tucked away in a corner of Moscow’s popular Izmaylovo Vernissage arts and craft fair, Viktor Mizgirev’s blacksmith shop teaches tourists, passer-bys and locals how to turn drab metal into something more elegant. Viktor Mizgirev was a woodcarver before he became one of Moscow’s most well-known, old-school blacksmiths. Born in the northern Russian city of Velikiy Ustyug, the hometown of Ded Moroz, the Russian equivalent of Santa Claus, Mizgirev’s passion for metal working came about as he was looking for a special tool for wood carving. “I couldn't find it in the shops, so I turned to the local blacksmith,” he said.” It was the sowing season, so the smith was busy repairing various agricultural hardware. He said, however, that he would let me use his smithy to forge the tool I needed myself." It was then that Mizgirev began to work more and more in the blacksmith shop, eventually got his own tools, and started to take paying customers. Apart from his work in the blacksmith shop, Mizgirev also continues to engrave wood and carve bone. He also tries to preserve the unique Russian craft of birch bark carving. He takes part in historical re-enactment festivals, and helps archaeologists to understand what kind of uses the items they unearth could have been put to; this is called “experimental archaeology." He also plans to partner with a goldsmith to make jewelry - but he is still a blacksmith, first and foremost. “Metal lets you do all kinds of things. If you’re friends with metal, it will let you shape it into anything at all. But if you come to the smithy in a bad mood, nothing comes out right, even a simple nail will come out crooked," Mizgirev said. Incidentally, his trademark is a big nail with a portrait on its head. Mizgirev reckoned there are plenty of good blacksmiths in Moscow these days, but real wrought iron items are expensive, and few can afford them. That is why the specialist shops are full of the cheap substitute: machine-bent metal which unscrupulous retailers try to pass off as wrought iron. “Some people just buy metal bars in DIY shops, bend them into shape using special machinery, and then weld the individual elements together," Mizgirev said. Mizgirev has four of his apprentices. The youngest, Ivan, has a degree in engineering, but said he has always dreamed of becoming a blacksmith. He has been Mizgirev's apprentice for more than a year and hopes to make a living as a blacksmith. For now, he has a day job at an advertising agency. He is especially good at is wrought-metal flowers. Another apprentice, Dmitry, worked with a wrought-iron eyeglasses frame. He has his own company that makes spectacle lenses. He once walked into Mizgirev’s shop just to have a look - and stayed for good. “It is physically very tiring, of course. I spend all my weekends here. But a change is as good as rest,” he said. Mizgirev said he has taught the basics of his craft to people from all walks of life. Some of them had no relevant background at all; others hardly needed any teaching. “I once had an American banker here in the smithy. His father and grandfather were also bankers. He told me it was the second time in his life he saw a hammer. I also had a member of the Russian parliament here, and he wasn't handy with tools at all. But crafting something with our own hands is an excellent way of developing our creative thinking. When a person starts making something with his hands, his head starts to work in a different way as well," Mizgirev said. Foreigners walk into Mizgirev’s blacksmith shop quite often. Most of them are driven by simple curiosity. But there are also those who actually try to work iron themselves, like the two couples who came recently from Finland. Tourists from Japan are usually taken aback by how young he is, Mizgirev said. In Japan, the popular image of a blacksmith is a wizened elderly man, not a strapping 25-year-old. "They just refuse to believe that I made all these items on display, and that I actually have apprentices at my tender age." Mizgirev has two kids, but both are too young to bring them to the iron working shop.The eldest, who is now three, has already picked his favorite toy: a 9-pound hammer. “I have no idea how he is able to lift it; I thought even the 3 pounder would be too heavy,” the blacksmith laughed.